Purple, green and gold were the colors of the day Saturday on Market Square Mall for the Knoxville Mardi Growl. The dog friendly howling good time is a fundraiser for the Young-Williams Animal Shelter. Pet vendors of all kinds were displaying their wares or providing educational materials. Plus, there was all kinds of fun. 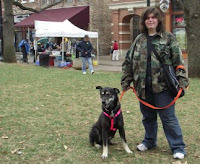 The event began with a dog friendly parade. Prizes were given for Congeniality, Pet-Owner look alike and Naked Dog. No Mardi Growl could be complete without a costume contest. I saw dogs wearing beats, jackets, coats and feather boas. It was a cacophony of bright colors and just plain fun.. The one thing that I didn't see was growling. 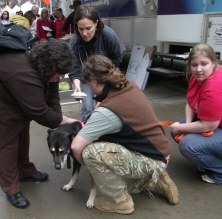 Microchipping and rabies vaccinations were available for $10 each. My daughter's dog Tomlin, was not as enthusiastic about being chipped as we were. Thanks to great staff at this dog friendly festival and a supportive friend he came through in the end. Even if you don't own a dog you can still have fun at the festival. Come to Market Square Mall. Pick your favorite restaurant with outdoor dining and watch the crowds. 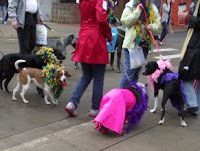 The dressed up dogs almost form your own parade - minus prizes. I saw several families with children but without dogs. They all seemed to be enjoying themselves. 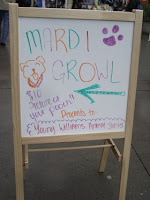 I'm attaching a couple of photos from Mardi Growl in Knoxville for you to enjoy. Next year, I'll be sure to take even more photos.